Blood libel (also blood accusation) is an accusation that Jews kidnapped and murdered the children of Christians to use their blood as part of their religious rituals during Jewish holidays. Historically, these claims—alongside those of well poisoning and host desecration—have been a major theme in European persecution of Jews. Blood libels typically say that Jews require human blood for the baking of matzos for Passover, although this element was allegedly absent in the earliest cases that claimed (the contemporary) Jews reenacted the crucifixion. The accusations often assert that the blood of children of Christians is especially coveted, and, historically, blood libel claims have been made to account for otherwise unexplained deaths of children. In some cases, the alleged victim of human sacrifice has become venerated as a martyr, a holy figure around whom a martyr cult might arise. Three of these — William of Norwich, Little Saint Hugh of Lincoln, Simon of Trent — became objects of local cults and veneration, and in some cases were added to the General Roman Calendar, even though they were lacking official canonization in the Roman Catholic Church. One, Gavriil Belostoksky, was canonized by the Russian Orthodox Church. 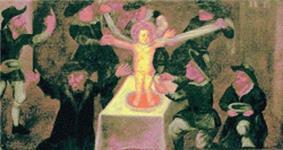 The supposed torture and human sacrifice alleged in the blood libels run contrary to the teachings of Judaism. According to the Bible, God commanded Abraham in the Binding of Isaac to sacrifice his son, but ultimately provided a ram as a substitute. The Ten Commandments in the Torah forbid murder. In addition, the use of blood (human or otherwise) in cooking is prohibited by the kosher dietary laws (kashrut). Blood from slaughtered animals may not be consumed, and must be drained out of the animal and covered with earth. (Lev 17:12-13) According to the Book of Leviticus, blood from sacrificed animals may only be placed on the altar of the Great Temple in Jerusalem (which no longer existed at the time of the Christian blood libels). Furthermore, consumption of human flesh would violate kashrut. While animal sacrifice was part of the practice of ancient Judaism, the Tanakh (Old Testament) and Jewish teaching portray human sacrifice as one of the evils that separated the pagans of Canaan from the Hebrews (Deut 12:31, 2 Kings 16:3). Jews were prohibited from engaging in these rituals and were punished for doing so (Ex 34:15, Lev 20:2, Deut 18:12, Jer 7:31). In fact, ritual cleanliness for priests prohibited them from even being in the same room as a human corpse (Lev 21:11). 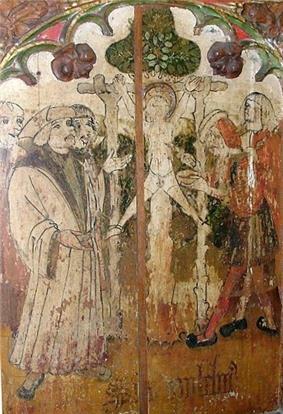 blood libel, also called blood accusation, is the superstitious accusation that Jews ritually sacrifice the children of Christians at Passover to obtain blood for unleavened bread. It first emerged in medieval Europe in the 12th century and was revived sporadically in eastern and Central Europe throughout the medieval and modern periods, often leading to the persecution of Jews. Though otherwise very different from the medieval myth, there are two records of ancient stories about Jewish acts of sacrifice that have been linked to the later blood libel stories of the medieval era. The first is in the writings of the Graeco-Egyptian author Apion, who claimed that Jews sacrificed Greek victims in their temple. This accusation is known from Josephus' rebuttal of it in Against Apion. Apion states that when Antiochus Epiphanes entered the temple in Jerusalem, he discovered a Greek captive who told him he was being fattened for sacrifice. Every year, Apion claimed, the Jews would sacrifice a Greek and consume his flesh, at the same time swearing eternal hatred to Greeks. Apion's claim probably repeats ideas already in circulation as similar claims are made by Posidonius and Apollonius Molon in the 1st century BC. The second story concerns the murder of a Christian boy by a group of Jewish youths. Socrates Scholasticus (fl. 5th Century) reported that some Jews in a drunken frolic bound a Christian child on a cross in mockery of the death of Christ and scourged him until he died. Professor Israel Jacob Yuval of the Hebrew University of Jerusalem published an article in 1993 that argues that blood libel may have originated in the 12th century from Christian views of Jewish behavior during the First Crusade. Some Jews committed suicide and killed their own children rather than be subjected to forced conversions. Yuval investigated Christian reports of these events and found that they were greatly distorted with claims that if Jews could kill their own children they could also kill the children of Christians. Yuval rejects the blood libel story as a fantasy of some Christians which could not contain any elements of truth because of the precarious nature of the Jewish minority's existence in Christian Europe. In England in 1144 Jews of Norwich were accused of ritual murder after a boy, William of Norwich, was found dead with stab wounds in the woods. William's hagiographer, Thomas of Monmouth, claimed that every year there is an international council of Jews at which they choose the country in which a child will be killed during Easter, because, he claimed, of a Jewish prophecy that states that the killing of a Christian child each year will ensure that the Jews will be restored to the Holy Land. In 1144 England was chosen, and the leaders of the Jewish community delegated the Jews of Norwich to perform the killing. They then abducted and crucified William. The legend was turned into a cult, with William acquiring the status of a martyr and pilgrims bringing offerings to the local church. This was followed by similar accusations in Gloucester (1168), Bury St Edmunds (1181) and Bristol (1183). In 1189, the Jewish deputation attending the coronation of Richard the Lionheart was attacked by the crowd. Massacres of Jews at London and York soon followed. In 1190 on March 16, 150 Jews were attacked in York and then massacred when they took refuge in the royal castle, where Clifford's Tower now stands, with some committing suicide rather than being taken by the mob. The remains of 17 bodies thrown in a well in Norwich between the 12th and 13th century (5 that were shown by DNA testing to likely be members of a single Jewish family) were very possibly killed as part of one of these pogroms. After the death of Little Saint Hugh of Lincoln, there were a series of trials and executions of Jews. The case is mentioned by Chaucer, and thus has become well-known. The eight-year-old Hugh disappeared at Lincoln on 31 July 1255. 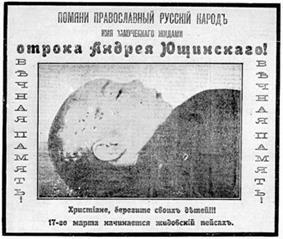 His body was discovered on 29 August, covered with filth, in a pit or well belonging to a Jewish man named Copin or Koppin. On being promised by John of Lexington, a judge, who happened to be present, that his life should be spared, Copin is said to have confessed that the boy had been crucified by the Jews, who had assembled at Lincoln for that purpose. King Henry III, on reaching Lincoln at the beginning of October, refused to carry out the promise of John of Lexington, and had Copin executed and 91 of the Jews of Lincoln seized and sent up to London, where 18 of them were executed. The rest were pardoned at the intercession of the Franciscans (Jacobs, Jewish Ideals, pp. 192–224). Within a few decades, Jews would be expelled from all of England in 1290 and not allowed to return until 1655. Thomas added that the Jews had misunderstood the words of their prophet, who by his expression "solo sanguine Christiano" had meant not the blood of any Christian, but that of Jesus—the only true remedy for all physical and spiritual suffering. Thomas did not mention the name of the "very learned" proselyte, but it may have been Nicholas Donin of La Rochelle, who in 1240 had a disputation on the Talmud with Yechiel of Paris, and who in 1242 caused the burning of numerous Talmudic manuscripts in Paris. It is known that Thomas was personally acquainted with this Nicholas. At Pforzheim, Baden, the corpse of a seven-year-old girl was found in the river by fishermen. The Jews were suspected, and when they were led to the corpse, blood allegedly began to flow from the wounds; led to it a second time, the face of the child became flushed, and both arms were raised. In addition to these miracles, there was the testimony of the daughter of the wicked woman who had sold the child to the Jews. A regular judicial examination did not take place; it is probable that the above-mentioned "wicked woman" was the murderess. That a judicial murder was then and there committed against the Jews in consequence of the accusation is evident from the manner in which the Nuremberg "Memorbuch" and the synagogal poems refer to the incident (Siegmund Salfeld, Das Martyrologium des Nürnberger Memorbuches (1898), pp. 15, 128-130). At Weissenburg, a miracle alone decided the charge against the Jews. According to the accusation, the Jews had suspended a child (whose body was found in the Lauter river) by the feet, and had opened every artery in his body to obtain all the blood. Again, supernatural claims were made: the child's wounds were said to have bled for five days afterward, despite its treatment. 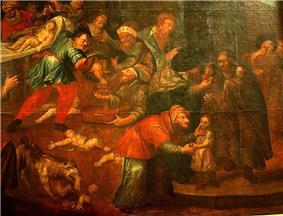 Simon of Trent, aged two, disappeared, and his father alleged that he had been kidnapped and murdered by the local Jewish community. Fifteen local Jews were sentenced to death and burned. 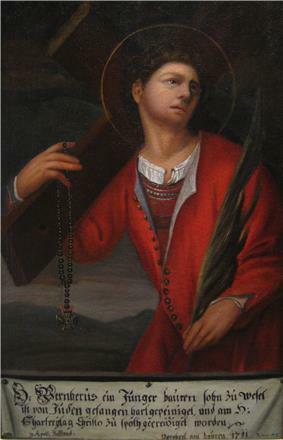 Simon was regarded locally as a saint, although he was never canonised by the church of Rome under Pope Sixtus V in 1588. His local status as a saint was removed in 1965 by Pope Paul VI, though his murder is still promoted as a fact by a handful of extremists. At Rinn, near Innsbruck, a boy named Andreas Oxner (also known as Anderl von Rinn) was said to have been bought by Jewish merchants and cruelly murdered by them in a forest near the city, his blood being carefully collected in vessels. The accusation of drawing off the blood (without murder) was not made until the beginning of the 17th century, when the cult was founded. The older inscription in the church of Rinn, dating from 1575, is distorted by fabulous embellishments—for example, that the money paid for the boy to his godfather turned into leaves, and that a lily blossomed upon his grave. The cult continued until officially prohibited in 1994 by the Bishop of Innsbruck. The only child-saint in the Russian Orthodox Church is the six-year-old boy Gavriil Belostoksky from the village Zverki. According to the legend supported by the church, the boy was kidnapped from his home during the holiday of Passover while his parents were away. Shutko, who was a Jew from Białystok, was accused of bringing the boy to Białystok, poking him with sharp objects and draining his blood for nine days, then bringing the body back to Zverki and dumping it at a local field. A cult developed, and the boy was canonized in 1820. His relics are still the object of pilgrimage. On All Saints Day, July 27, 1997, the Belorussian state TV showed a film alleging the story is true. The revival of the cult in Belarus was cited as a dangerous expression of antisemitism in international reports on human rights and religious freedoms which were passed to the UNHCR. 1823-1835 Velizh blood libel: After a Christian child was found murdered outside of this small Russian town in 1823, accusations by a drunk prostitute led to the imprisonment of many local Jews. Some were not released until 1835. In March 1879, ten Jewish men from a mountain village were brought to Herald of Europe and Saint Petersburg Notices expressed their amazement that medieval prejudice should have found a place in the modern judiciary of a civilized state, New Times hinted darkly of strange Jewish sects with unknown practices." The trial ended in acquittal, and the orientalist Daniel Chwolson published a refutation of the blood libel. Antisemitic flier in Kiev, 1915: "Christians, take care of your children!!! It will be Jewish Passover on March 17." Jews were frequently accused of ritual murder of Christians for their blood in Der Stürmer, an antisemitic newspaper published in Nazi Germany. The infamous May 1934 issue of the paper was later banned by the Nazi authorities, because it went as far as comparing alleged Jewish ritual murder with the Christian rite of communion. The 1944-1946 Anti-Jewish violence in Poland which killed an estimated 1000-2000 Jews (237 documented cases, constituting 2 to 3 percent of the total number of victims of postwar violence in the country) involved, among other elements, accusations of blood libel, especially in the case of the 1946 Kielce pogrom. King Faisal of Saudi Arabia (r. 1964–1975) made accusations against Parisian Jews that took the nature of a blood libel. The Matzah Of Zion was written by the Syrian Defense Minister, Mustafa Tlass in 1986. The book concentrates on two issues: renewed ritual murder accusations against the Jews in the Damascus affair of 1840, and The Protocols of the Elders of Zion. The book was cited at a United Nations conference in 1991 by a Syrian delegate. On October 21, 2002, the London-based Arabic paper Al-Hayat reported that the book The Matzah of Zion was undergoing its eighth reprinting and was being translated into English, French and Italian. Egyptian filmmaker Munir Radhi has announced plans to adapt the book into a film. In 2003 a private Syrian film company created a 29-part television series matzah. In early January 2005, some 20 members of the antisemitic canards, such as “the whole democratic world today is under the financial and political control of international Jewry. And we do not want our Russia to be among such unfree countries”. This demand was published as an open letter to the prosecutor general, in Rus Pravoslavnaya (Russian: Русь православная, "Orthodox Russia"), a national-conservative newspaper. This group consisted of members of the ultra-nationalist Liberal Democrats, the Communist faction, and the nationalist Motherland party, with some 500 supporters. Тhe mentioned document is known as "The Letter of Five Hundred" ("Письмо пятисот"). Their supporters included editors of nationalist newspapers as well as journalists. By the end of the month this group had received stiff criticism, and retracted its demand. At the end of April 2005, five boys, ages 9 to 12, in Krasnoyarsk (Russia) disappeared. In May 2005, their burnt bodies were found in the city sewage. The crime was not disclosed, and in August 2007 the investigation was extended until November 18, 2007. Some Russian nationalist groups claimed that the children were murdered by a Jewish sect with a ritual purpose. Nationalist M. Nazarov, one of the authors of "The Letter of Five Hundred" alleges "the existence of a 'Hasidic sect', whose members kill children before Passover to collect their blood," using the Beilis case mentioned above as evidence. M.Nazarov also alleges that "the ritual murder requires throwing the body away rather than its concealing". "The Union of the Russian People" demanded officials thoroughly investigate the Jews, not stopping at the search in synagogues, Matzah bakeries and their offices. During interview which aired on Rotana Khalijiya TV on August 13, 2012, Saudi Cleric Salman Al-Odeh stated (as translated by MEMRI) that "It is well known that the Jews celebrate several holidays, one of which is the Passover, or the Matzos Holiday. I read once about a doctor who was working in a laboratory. This doctor lived with a Jewish family. One day, they said to him: 'We want blood. Get us some human blood.' He was confused. He didn't know what this was all about. Of course, he couldn't betray his work ethics in such a way, but he began inquiring, and he found that they were making matzos with human blood." Al-Odeh also stated that "[Jews] eat it, believing that this brings them close to their false god, Yahweh" and that "They would lure a child in order to sacrifice him in the religious rite that they perform during that holiday." In April 2013, the Palestinian non-profit organization MIFTAH, founded by Hanan Ashrawi apologized for publishing an article which criticized US President Barack Obama for holding a Passover Seder in the White House saying "Does Obama in fact know the relationship, for example, between ‘Passover’ and ‘Christian blood’...?! Or ‘Passover’ and ‘Jewish blood rituals? !’ Much of the chatter and gossip about historical Jewish blood rituals in Europe are real and not fake as they claim; the Jews used the blood of Christians in the Jewish Passover." MIFTAH's apology expressed its "sincerest regret." In an interview which aired on the Al-Quds TV channel on July 28, 2014 (as translated by MEMRI), Osama Hamdan, the top representative of Hamas in Lebanon, stated that "we all remember how the Jews used to slaughter Christians, in order to mix their blood in their holy matzos. This is not a figment of imagination or something taken from a film. It is a fact, acknowledged by their own books and by historical evidence." In a subsequent interview with CNN's Wolf Blitzer, Hamdan defended his comments, stating that he "has Jewish friends." In a sermon broadcast on the official Jordanian TV channel on August 22, 2014, Sheik Bassam Ammoush, a former Minister of Administrative Development who was appointed to Jordan's House of Senate ("Majlis al-Aayan") in 2011, stated (as translated by MEMRI): "In [the Gaza Strip] we are dealing with the enemies of Allah, who believe that the matzos that they bake on their holidays must be kneaded with blood. When the Jews were in the diaspora, they would murder children in England, in Europe, and in America. They would slaughter them and use their blood to make their matzos... They believe that they are God's chosen people. They believe that the killing of any human being is a form of worship and a means to draw near their god." In 1911, the Dictionnaire apologétique de la foi catholique, an important French Catholic encyclopedia, published an analysis of the blood libel accusations. This may be taken as being broadly representative of educated Catholic opinion in continental Europe at that time. The article noted that the popes had generally refrained from endorsing the blood libel, and it concluded that the accusations were unproven in a general sense, but it left open the possibility that some Jews had committed ritual murders of Christians. Other contemporary Catholic sources (notably the Jesuit periodical Civiltà cattolica) promoted the blood libel as truth. St. Pius V in the bull Hebraeorum gens (26 February 1569) did not reference blood libel, but he did make multiple accusations against the Jews, including: usury, theft, receiving stolen goods, pimping, divination and magic. He finishes with this accusation: "Finally, we have sufficiently investigated and explored how unworthily this perverse race attacks the name of Christ; how much hated it is by all those who bear that name; and, finally, with what cunning it plots against their lives." 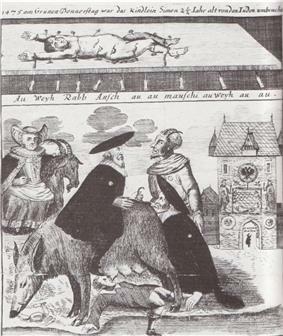 Pope Benedict XIV wrote a bull Beatus Andreas (22 February 1755) in which he does not express any doubt concerning the murders of children ascribed to the Jews. He states they are perpetrated "out of hatred of Christ" and "out of hatred for the Christian faith" in his De servorum Dei beatificatione. In the bull he speaks about determining what is to be done "when there arises a case of this sort, which often comes to be put forward, concerning some boy who was slain by the Hebrews in Holy Week out of hostility to Christ, such as Blessed Simon and Anderl and also many of the other murdered boys whom the authors mention". In 2003, the Egyptian newspaper Al-Ahram published a series of articles by Osama Al-Baz, a senior advisor to then Egyptian President Hosni Mubarak. Among other things, Osam Al-Baz explained the origins of the blood libel against the Jews. He said that Arabs and Muslims have never been antisemitic, as a group, but accepted that a few Arab writers and media figures attack Jews "on the basis of the racist fallacies and myths that originated in Europe". He urged people not to succumb to "myths" such as the blood libel. ^ Turvey, Brent E. Criminal Profiling: An Introduction to Behavioral Evidence Analysis, Academic Press, 2008, p. 3. "Blood libel: An accusation of ritual murder made against one or more persons, typically of the Jewish faith". ^ a b Chanes, Jerome A. Antisemitism: A Reference Handbook, ABC-CLIO, 2004, pp. 34–45. "Among the most serious of these [anti-Jewish] manifestations, which reverberate to the present day, were those of the libels: the leveling of charges against Jews, particularly the blood libel and the libel of desecrating the host. ^ Goldish, Matt. Jewish Questions: Responsa on Sephardic Life in the Early Modern Period, Princeton University Press, 2008, p. 8. "In the period from the twelfth to the twentieth centuries, Jews were regularly charged with blood libel or ritual murder— that Jews kidnapped and murdered the children of Christians as part of a Jewish religious ritual." 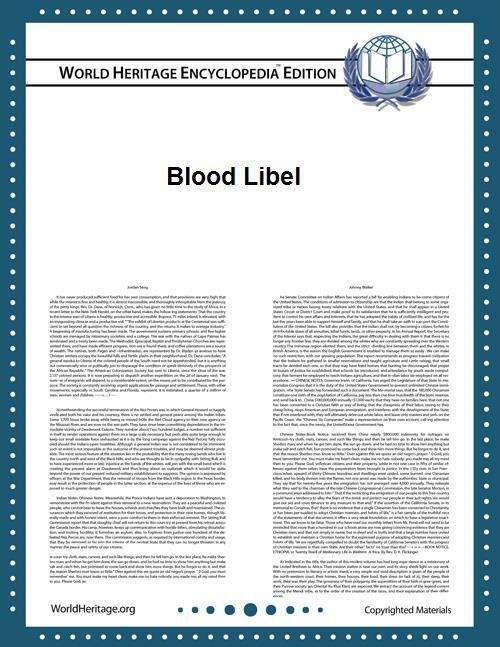 ^ "Blood libel", Encyclopædia Britannica, 2012. ^ Paul R. Bartrop, Samuel Totten, Dictionary of Genocide, ABC-CLIO, 2007, p.45. ^ Louis H. Feldman, Jew and Gentile in the Ancient World:Attitudes and Interactions from Alexander to Justinian, Princeton University Press, Princeton, NJ, 1993. pp.126-7. ^ Feldman, Louis H. Studies in Hellenistic Judaism, Brill, 1996, p. 293. ^ Paper on William of Norwich presented to the Jewish Historical Society of England by Raphael Langham; Langmuir, Gavin I (1996), Toward a Definition of Antisemitism, University of California Press, pp.216ff. ^ The Knight's Tale of Young Hugh of Lincoln", Gavin I. Langmuir, Speculum, Vol. 47, No. 3 (July 1972), pp. 459 - 482. ^ "Katholische Schweizer-Blätter," Lucerne, 1888. ^ Medieval Sourcebook: A Blood Libel Cult: Anderl von Rinn, d. 1462 www.fordham.edu. ^ Effie Ambler, Russian Journalism and Politics: The Career of Aleksei S. Suvorin, 1861-1881 (Detroit: Wayne State University Press, 1972: ISBN 0-8143-1461-9), p. 172. ^ German propaganda archive - Caricatures from Der Stürmer, Calvin College website. ^ "Islamic Movement head charged with incitement to racism, violence", Haaretz, January 29, 2008. ^ "Interview with two members of a Polish team of anthropologists, sociologists and one theologian researching the persistence of blood libel myths"
^ Egyptian extremists an ill wind in Arab Spring by Harry Sterling, Calgary Herald, September 2, 2011. ^ Blood Libel on Hamas' Al-Aqsa TV – American Center for Islamic Research President Dr. Sallah Sultan: Jews Murder Non-Jews and Use Their Blood for Passover Matzos, MEMRI, Special Dispatch No. 2907, April 14, 2010. ^ Blood Libel on Hamas TV - President of the American Center for Islamic Research Dr. Sallah Sultan: Jews Murder Non-Jews and Use Their Blood to Knead Passover Matzos, MEMRITV, Clip No. 2443 - Transcript, March 31, 2010 (video clip available here). ^ Islamic group invited anti-Semitic speaker, The Local (Sweden's News in English), March 25, 2011. ^ Egypt: More Calls to Murder Israelis by Maayana Miskin, Arutz Sheva 7 (Isranelnationalnews.com), August 28, 2011. ^ Why the Muslim Association doesn’t expresses reservations towards Antisemitism by Willie Silberstein, Coordination Forum for Countering Antisemitism (CFCA), April 17, 2011. ^ Saudi Cleric Salman Al-Odeh: Jews Use Human Blood for Passover Matzos, MEMRITV, Clip No. 3536, (transcript), August 13, 2012. ^ Saudi cleric accuses Jewish people of genocide, drinking human blood by Ilan Ben Zion, The Times of Israel, August 16, 2012. ^ Egyptian Politician Khaled Zaafrani: Jews Use Human Blood for Passover Matzos, MEMRITV, Clip No. 3873 (transcript), May 24, 2013 (see also: Video Clip). ^ Egyptian Politician: Jews Use Human Blood for Passover Matzos by Elad Benari, Arutz Sheva, June 17, 2013. ^ Egyptian politician revives Passover blood libel by Gavriel Fiske, Times of Israel, June 19, 2013. ^ Egyptian Politician Smiles Giddily as He Pushes anti-Semitic Libel that Jews Use Blood of Christian Children for Passover Matzos by Sharona Schwartz, The Blaze, June 17, 2013. ^ Blood libel: the myth that fuels anti-Semitism by Candida Moss and Joel Baden, special to CNN, August 6th, 2014. ^ Friday Sermon by Former Jordanian Minister: Jews Use Children's Blood for Their Holiday Matzos, MEMRI Clip No. 4454 (transcript), August 22, 2014. (video clip available here). ^ As shown by David Kertzer in The Popes Against the Jews (New York, 2001), pp. 161-63.